We start with an amuse bouche, a shot with beef tendon, chanterelles and tartivo. Warms the stomach on a cold winter day. Goat milk bavarois with olive oil - the bavarois is made with fresh goat milk flown daily from Kyoto, which was just incredibly light and fluffy - the Japanese would call it フワフワ. Comes with a blend of 4 different olive oils - from France, Italy, Spain, and Australia. Sprinkled with fleur de sel from Brittany, and garnished with Macadamia nuts and lily bulb. 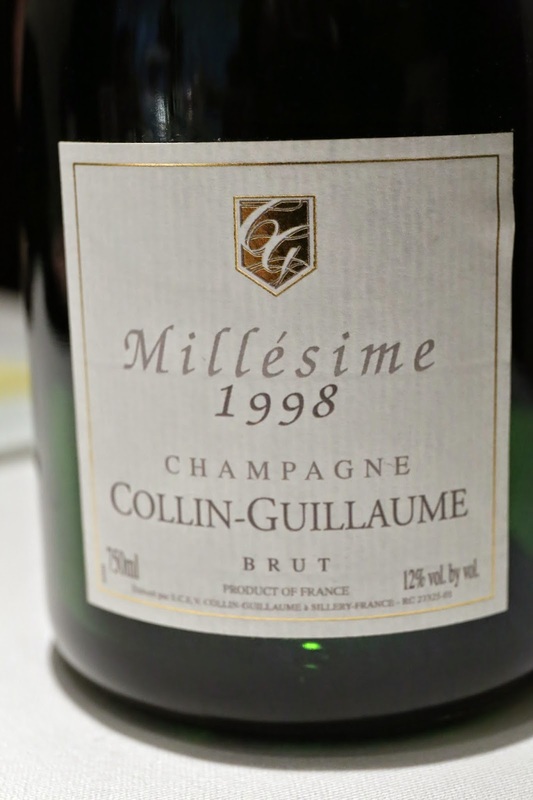 Very interesting balance between the saltiness and acidity, and also between the oiliness and creaminess. Gâteau salé - Parmigiano Reggiano cake, topped with raw brown mushrooms marinated in vinegar and herbs, and raw Hokkaido sea urchin. The presentation was absolutely stunning. The savory cake was interesting, but the mushrooms were more interesting because they were still a little firm, yet softened by the vinegar marinade. The sharp acidity from the vinegar was tempered by sweetness from the creamy sea urchin. In short, everything came together like a charm. Pan-seared Spanish mackerel - the Spanish mackerel from the Naruto Straits (鳴門海峡) in Tokushima Prefecture (徳島県) was pan-seared on the skin side for 1 minute at 320° C, then put in the oven for 15 minutes at 100° C. Garnished with hiroko (ひろこ) shoots from Akita Prefecture (秋田県) done in a Chartreuse sauce, along with red turnip from Aichi Prefecture (愛知県) and some cashew nuts. The fish was beautiful, and absolutely perfection. Our server made sure to point out that the center was still pink. Tender. Succulent. Perfect. And the result speaks for itself. Just look at that beautiful piece of meat... soooo tender, perfectly cooked, and all that flavor from the fat... I swear it's better than the best piece of prime rib I've ever tasted. Served with eringi mushroom (鮑茸) and chijimi spinach (ちぢみほうれん草) in an aged rum sauce. Baked cheesecake - yup, this is a Japanese-style cheesecake, and I don't like them soft, fluffy, light and tasteless Japanese cheesecakes... except this ain't your typical version. This is made with apricot liqueur that has had the alcohol taken out... and will you just look at that beautiful brûlée?! Yes, it's still fluffy inside and not dense like the New York cheesecakes I like. But this tasted goooooood! Meringue ice cream - this was made with almond, milk, and meringue that's been ground into powder. The texture was just soooooo smooth... Served with a couple of spritz of sea water reduction. I took my spoon and slowly, lovingly ran it over to top of the quenelle... removing with each stroke only the very outer edge that had softened, and making sure that I get a little bit of the sea water reduction which had collected at the bottom of the bowl. Salty milk ice cream seems to be the thing in Tokyo right now, based on my limited experience in the last 3 days... This was just beautiful. If it hadn't hit me until now, I realized today that Fergie is the little devil that perches on your shoulder and eggs you on about doing things that you shouldn't do. I wasn't thinking about drinking at lunch at all, but he ordered a couple of bottles and kept telling me to drink... So I sipped a little. 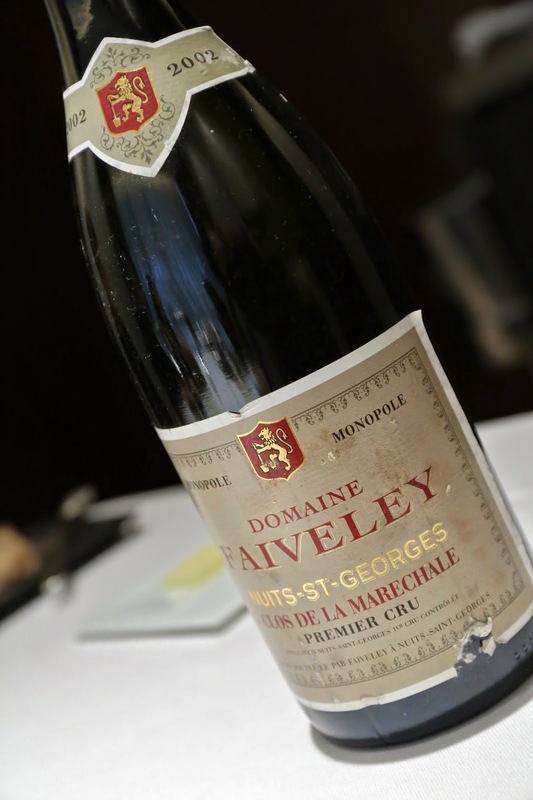 Interesting to drink a bottle from a vintage when the land was still leased to Faiveley, as I've only had wines made after Mugnier took it back and made the wines under his own label. I think the sommelier was suitably impressed when I told him that I had actually tasted the white version of Maréchale when I visited Frédéric Mugnier at his domaine, because that wine has only been made in the last few years and production is incredibly small. What an absolutely incredible lunch! Every single course was amazing, and some were mind-blowing. There was simply no question that this was 3-star quality, and I certainly understand why the restaurant had been included as part of Asia's 50 Best. Several of my friends have raved about their lunches here, saying that it is incredibly good value for money, and I definitely agree that the price/performance ratio is off the charts. If only I lived in Tokyo... I'd probably come here once a month.